AVAILABLE NOW AT VINTAGE KING! Man, I love those mad scientist fuzzes with too many knobs! I’ve collected them for decades and used them on a zillion sessions. It got to the point were people were hiring me specifically to make those sort of farting, fried-circuit tones. But the downside of those complex fuzzes is that they’re a little too wide-ranging, with many settings you’ll probably never use. It’s easy to spend 20 minutes dicking around with the dials without nailing the perfect tone. I’ve always wished for a wild, highly variable fuzz that was a bit more “curated,” with easier access to the tones you’re likeliest to use. That’s what inspired the Filth Fuzz. It’s only got four controls, but it’s a cornucopia of cool, quirky, and usable fuzz flavors. The drive and level controls do what you’d expect. But unlike many fuzz drive controls, this one sounds great throughout its range. Extreme settings are molten-lava thick. Lower settings are like…slightly cooled lava, maybe? But the real action is in the two sliders. They’re tone controls of a sort, but not in the usual way. Most fuzz tone controls are tone-sucking passive circuits situated downstream from the fuzz effect. But here, the sliders alter the voltages at the transistors, radically changing not only the tone, but also the timbre, response, attack, sustain, and compression. In other words, the sliders radically alter the fuzz’s core character, as opposed to simply EQing a single core tone. Prog-rock mastermind Matte Henderson shared the Filth clip below. Matte showcases two of the pedal’s personalities: farty and fat. This just in: Eff me, David Torn is soooooo good. He just posted a stupendous looped improv recorded with Filth. I’m speechless with admiration. TO USE: Set desired gain and output levels. Move the sliders till it sounds awesome. CAUTIONS: Filth sounds best before any buffered effects. It usually works best at or near the front of your effect chain. 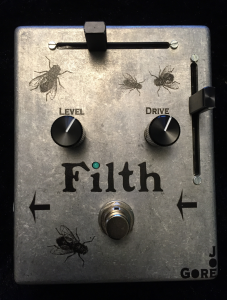 Filth Fuzz was created in San Francisco and is built in Michigan by skilled craftspeople earning a fair wage. Available now from Vintage King!